I am developing a commandline tool to experiment with lofting a set of curves, and would appreciate any guidance. c0.txt, c1.txt: two or more 3D curves represented as a text file each listing the ordered curve samples, one xyz coordinate triplet per line. These are usually just polylines finely sampling some curve fragments. A file storing a surface between these curves, tautly stretching over the curve fragments as best as possible. Speed is desirable but not a big deal since I just want to experiment first prior to writing optimal code. Easy to install for others to use. Ideally, just downloading blender should suffice. So far it seems BSurfaces's loft functionality is the most feature-rich out there, so I went with that. I want to target all its fancy controls and possibilities in the long run. # ^-- less one because one point is added when the spline is created. The current solution works from the GUI python console, but I'm still having a hard time calling it from commandline without the '-b' option. Cheating by calling without '-b' and calling bpy.ops.wm.quit_blender() in the end main works OK as prototype. 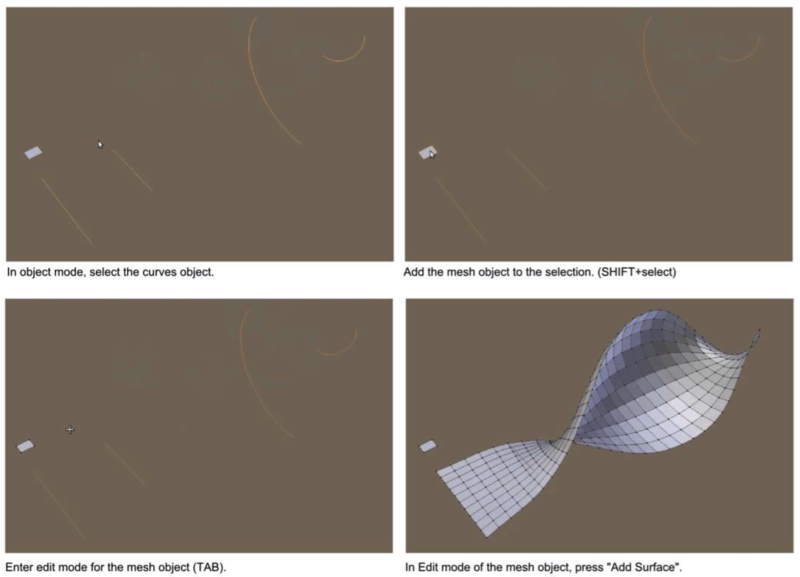 Besides the current issue above, I would like to call the script directly from C or standalone python so that we don't have to set up blender entirely each time we're lofting between curves. I cannot use a lower-level API than bpy with this solution since BSurfaces is very intertwined with bpy to the basic level. This discussion should be useful for anyone writing tools that seemlessly use blender in the background. I am not very experienced with blender. My main question is whether this all looks like a decent way to go, besides the above specific issue. Note: After I initially wrote this question, partial solutions have been evolving and I have been updating this accordingly. Sorry if it seems like a multi-question question during this process. Feel free to post partial answers and evolve, this would already be useful, though I will accept the answer if it is thorough enough. Browse other questions tagged python modeling scripting curves command-line or ask your own question. How to make UV loft like 3ds Max in Blender using curves? How fill face between irregular curves? How do you loft between curves?